Here at The Storytellers a family portrait is a team effort from beginning to end. Kathi and I talk about and preplan the session, with the client’s input, weeks before the event. I will suggest a location, when doing out door portraits, that is at its best for that time of year and will work for the size of their group. If the client wants portraits done at their home or any place I’ve never seen I will first visit that location, at the same time of day scheduled for their session, to verify that the location will look at least as good as our tried and true locations before I will consent to their request. One of the most important parts of this preplanning is the clothing consultation. When clients take our suggestions to simplify their clothing selections to solid colors (no stripes or patterns) of lower contrast (don’t mix whites and black or the extremes of a single color) and use muted tones like shades of blue, green or grey, they always like their portraits better than clients that ignore our advice. With simple clothing colors your eyes are drawn to the subjects’ faces in a portrait not what they’re wearing. This image is the final art worked, retouched, and cropped file that went to the printer for their wall portrait. To illustrate our collaborative process lets step back to how this portrait evolved. We don’t know exactly how we’re going to pose a family group until the moment we meet them all. We did know that with this family of three, with two dogs, that our medium posing rock would suffice if needed. Our goal with our posing rocks, or any on site natural rocks or logs, is to vary our subjects head heights. We avoid simply lining up a standing group of people, firing squad style, the way many amateur photographers do. In addition seating people often makes them look more relaxed. Once Kathi sees the client’s body types she is already mentally posing them as a group. Keeping in mind that we already know that the client is not sure if they want to replace their current vertical image or change to a horizontal orientation. Composing both vertical and horizontal groupings at each location you choose or tighter grouping will allow for either. As soon as I’ve decided which spot within the location (here we used Kathryn Albertson Park in Boise, Idaho) to start the session, Kathi asks me where I want the posing rock placed for the best background. This is critical for me because I build a portrait from the background forward. And it often does not matter where she puts it because after I see where our subjects’ heads land on the background I ask her to move the rock anyway! This is why two sets of eyers are so important in this process. Kathi will often see things that I don’t and I, being at camera position, will see things that Kathi can’t see. Our main goal is to make our subjects look as good as we can and fix objectionable details before we take any photos to minimize the things Kathi has to fix in post-production later. To illustrate here’s the before image…. One of the big changes here is that when the clients picked their favorite image for their 20x24” Wall Portrait they wanted it to be a Vertical print. Of course I shot this as a horizontal image! However, this was a pretty easy fix because Kathi has been constantly reminding me over the years to “Shoot Loose” when framing up groups in my viewfinder to minimize the background artwork to fill-in areas needed to make a print in any size. In addition to her usual retouching of the clients eyes or facial blemishes the red circled areas are the areas Kathi did enhancement art work. 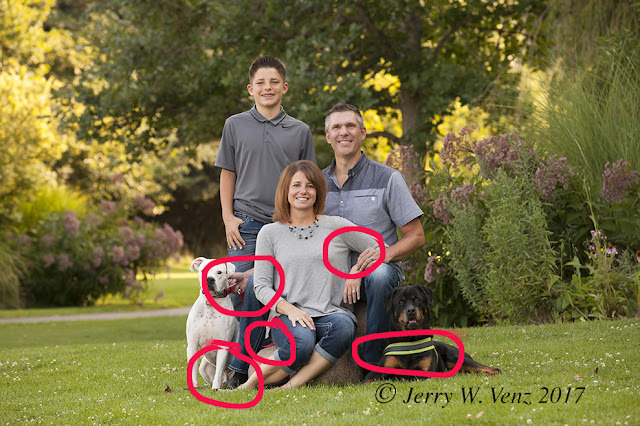 The client requested the removal of their black dog’s harness and the dad’s hand holding on to the white dog’s collar. 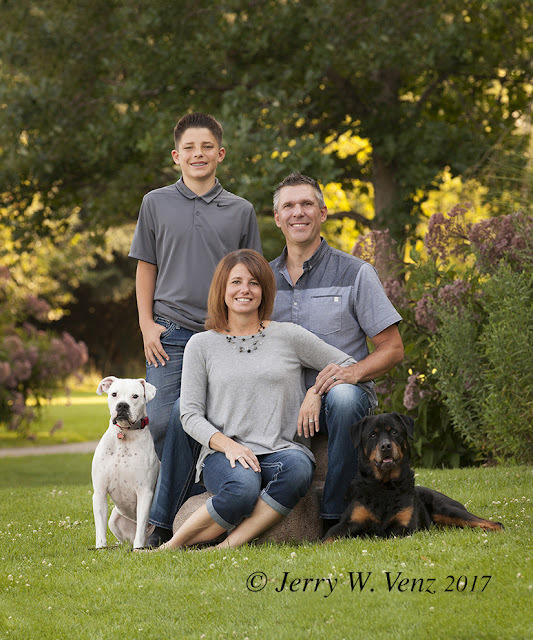 That was OK with Kathi because she knew the changes were possible and if she knows she can doit and it’s always included with any purchase of our custom wall portraits. However, one thing we’ve learned over the years is that small objectionable things that are OK on a computer monitor become Big Objectionable Things on wall prints, especially when the print is 20x24” or larger! Case in point—when Kathi zoomed-in on the white dog (see his circled leg) she noticed his exposed private parts would surely become very objectionable when enlarged! So, she moved the dog’s leg to cover it’s privates. Good catch on Kathi’s part—nobody saw this at the premier—and great use of her skills in Photoshop—adding value for the client and making this a fabulous wall print! In order to become successful at dealing with clients during a portrait session you must pay the utmost attention to everything happening in front of your camera and less to the back of the camera! A professional’s technical proficiency needs to be a given; it’s all the other things we do that make our client’s look great and have a fun portrait experience that also makes us money.